BP reported further progress Tuesday in stemming the Gulf of Mexico oil spill, but new evidence showed part of the slick could be swept to Florida’s beaches and sensitive coral reefs. The British energy giant, which has been struggling to contain a month-long environmental disaster, said a tube inserted into a leaking oil pipe is now sucking up about 40 percent of the crude, twice as much as a day earlier. The company said its “riser insertion tube tool” is carrying about 2,000 barrels a day of oil up to the Discoverer Enterprise drill ship on the surface via a mile-long pipe. BP reckons about 5,000 barrels, 210,000 gallons of crude, is spewing each day from the wreckage of the Deepwater Horizon rig, although analysis from independent experts suggests the flow rate could be many times that. 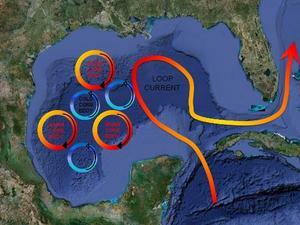 The Sidney Morning Herald ’s Clement Sabourin reports that worries over the ecological impact of the huge oil spill are growing, with the most recent fears focused on its possible spread into a “loop current” that could carry the pollution to the Florida Keys and nearby tourist beaches. The U.S. government announced it was extending fishing closures to 19 percent of the Gulf of Mexico because of fears the slick’s proximity to the current could already be putting harvested seafood at risk. Satellite imagery “indicates that the main bulk of the oil is dozens of miles away from the loop current, but that a tendril of light oil has been transported down close to the loop current,” said top official Jane Lubchenco. “The proximity of the southeast tendril of oil to the loop current indicates that oil is increasingly likely to become entrained in the loop current if it is not already. When that occurs oil could reach the Florida Strait in eight to 10 days,” she said, as experts analyzed 20 tar stains found on a beach in Key West to determine if they were from the spill. With hugely popular tourist beaches and fragile coral reefs around the southern tip of the peninsula, the loop current has the potential to take the economic and environmental impact of the spill to a whole new level. There are also concerns that huge underwater plumes of crude could be starving the sea of oxygen, meaning that the slick is having a far greater impact on the marine environment than previously thought. An expert from the Harte Research Institute for Gulf of Mexico Studies told AFP that deepwater spills posed greater risks due to these plumes. Meanwhile in Washington, U.S. Interior Secretary Ken Salazar told lawmakers he expected BP to attempt a “dynamic kill” to further contain the oil spewing from the well. “The expectation is that this Saturday or this Sunday the triggers will be pulled for a dynamic kill of the well,” Salazar told the Senate Energy and Natural Resources Committee, explaining that this would involve injection of fluids and other materials to stem the flow. Salazar said he was revamping the maligned Minerals and Management Service (MMS) to tighten regulation and working with the White House and lawmakers on broader reforms, based on input from a national commission to be named by President Barack Obama. “Bringing together a national commission that will look at all the facts… will help guide the energy future of the United States,” he said. The spill appeared to claim its first political casualty, with the announced retirement of Chris Oynes, who oversaw offshore energy for the MMS, which has come in for scathing criticism over the enforcement of safety standards. Congressional hearings have revealed multiple warning signs that were overlooked before the 20 April blast on the Deepwater Horizon rig that killed eleven people and touched off the catastrophe.